As the manufacturer and direct wholesale-to-the-public dealer, we are able to offer you the highest quality, strongest and most capable retractable awning on the market. Our prices have been 40% off retail since 2008. Back then, we found ways to streamline our manufacturing process and have been passing on those savings to our customers ever since. Our Buzzman Retractable Awnings include a Somfy Motor, Remote and Digital Wireless Wind Sensor. Do you have a price list I can see? Of Course! We don’t hide this information like others, no hidden fees, no mark-up’s to allow for discounts. Click HERE to download our latest price list. In addition to accepting cash & checks we accept all major credit cards and even have financing available thru BLISPAY. What are my fabric and valance options? We offer only the highest grade Sunbrella Marine & Awning Fabric with over 300 colors/patterns to choose from. 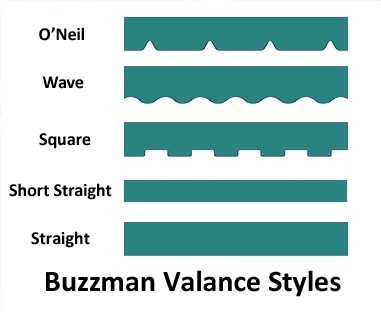 Buzzman Awning offers our customers their choice of 5 different valance styles. How long does it take to get my Buzzman Retractable Awning? After we receive your deposit, the fabric is ordered to be custom cut, sewn and finished by the Sunbrella mill. We generally receive the finished fabrics about 10-14 business days from our order with the mill. Installation is scheduled generally the week after the fabric shipment arrives at our office. The whole process takes only about 4 weeks; allowing you to be sitting in the shade as soon as possible. How much time is needed to install my Buzzman Retractable Awning on my home? Typically it takes 3-4 hours for a Buzzman Retractable Awning to be installed; however larger awnings may take 6+ hours. Installations are generally completed in one day by our team of professional technicians, weather permitting. Already have a retractable awning and need a new fabric cover? Call us and we can help! We can recover most retractable awnings with Sunbrella Marine and Awning fabric. What is the warranty on my Buzzman Retractable Awning? Our exclusive Buzzman Retractable Awning frame is backed by a LIMITED LIFETIME WARRANTY to the original owner. The Sunbrella Marine Grade Fabric carries a 10-year manufacturer prorated warranty, guaranteed not to fade, or mildew. The Somfy motor, remote control and wireless wind sensor have a 5-year warranty from the Somfy Corporation. Please note, Labor costs are not included in the warranty.